Molecules and ions move freely in gases and liquids, each type of these particles tends to spread out evenly within the space available. This is diffusion. + from a region of its higher concentration to a region of its lower concentration. + no energy is used. 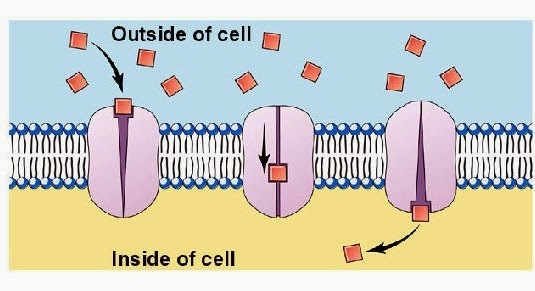 Some molecules and ions are able to pass through cell membranes --> The membrane is permeable. 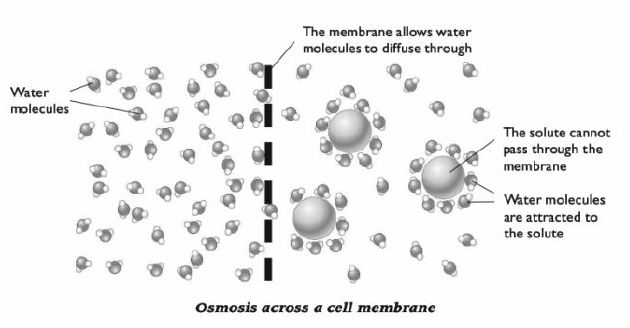 Some substances cannot pass through cell membranes --> The membrane is partially permeable. 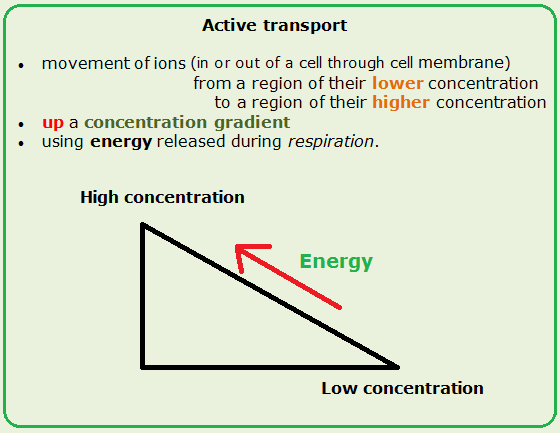 Example: O2 is at a higher concentration outside a cell (inside the cell it is being used in respiration). Oxygen molecules are small and do not carry an electrical charge --> they can pass freely through the phospholipid bilayer -->O2 diffuses from outside to the inside of the cell, down its concentration gradient. + with the aid of special channel or carrier protein. Ions or electrically charged molecules are not able to diffuse through the phospholipid bilayer because they are repelled from the hydrophobic tails. Large molecules are also unable to move through the phospholipid bilayer freely. However, the cell membrane contains special channel protein that provide hydrophilic passageways for these special ions and molecules. 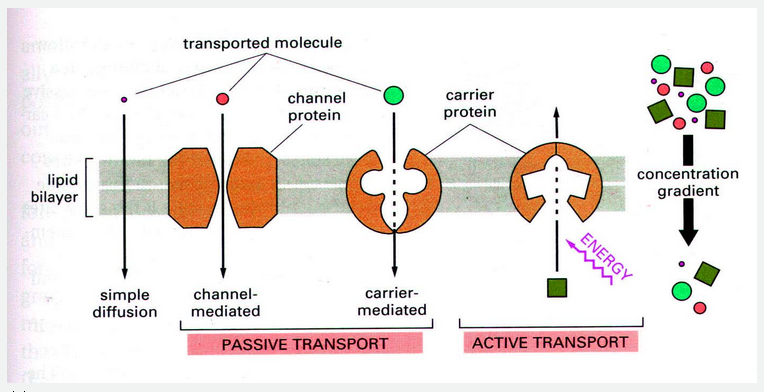 Diffusion through these channel proteins is called facilitated diffusion. Like 'ordinary' diffusion, it is entirely passive. Each carrier protein has its own shape and only allows one molecule (or one group of closely related molecules) to pass through. Selection is by size; shape; charge. + down a water potential gradient. The solute molecules are too large to get through the membrane. Water molecules carry tiny electrical charges but they ar small --> can move freely through the phospholipid bilayer of most cell membranes --> diffuse across cell membranes. 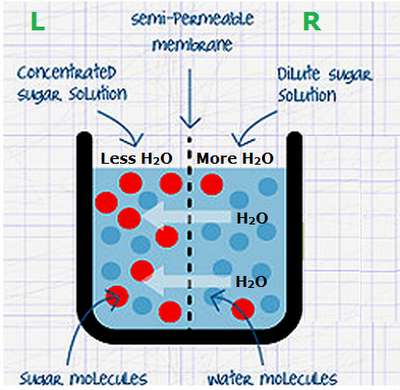 - The concentration of sugar molecules is higher on the concentrated solution (L) and lower on the diluted one (R). - The concentration of water molecules is higher on the (R) and lower on the (L). 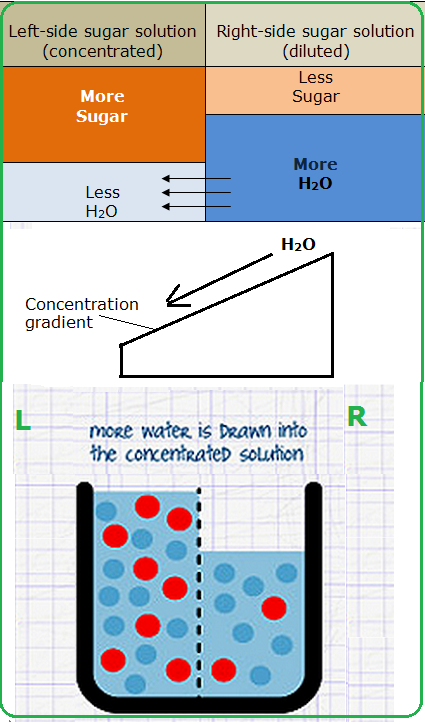 It is confusing to talk about the 'concentration of water', so we can say that a diluted solution (R) has a hige water potential and a concentrated solution (L) has a low water potentia. There is a water potential gradient between the 2 sides. The water molecules diffuse down this gradient, from a high water potential (R) to a low water potential (L). - Pure water ψ = O kPa. a concentrated sucrose solution ψ = -4000 kPa. - Water moves by osmosis down a water potential gradient, from a high ψ (- 250 kPA) to a low ψ (- 4000 kPA). 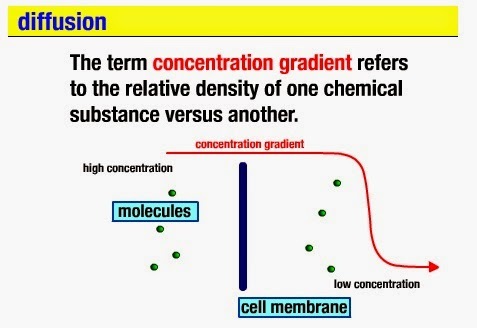 Sometimes substances are required to be move against the concentration gradient, or faster than they would by passive transport. In these cases, active processes are used, which require energy. There are many occasions when cells need to take in substances which are only present in small quantities around them. E.g. root hair cells in plants take in nitrate ions from the soil. Their concentration are often higher inside the root hair cell than in the soil, so the diffusion gradient is from the root hair à the soil. 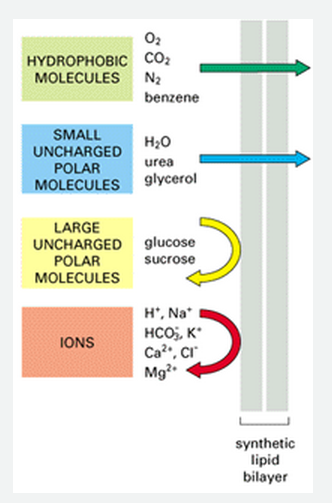 Despite this, the root hair cells still can take nitrate ions in, by active transport. 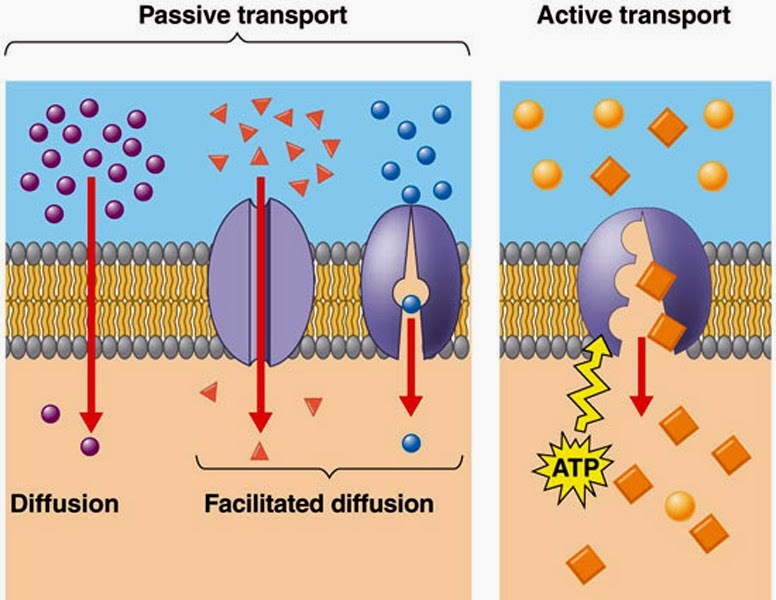 The active transport is done using carrier (transporter) proteins in the cell membrane. These use energy from the breakdown of ATP to move the ions into the cell. The carrier proteins are ATPases. Each carrier protein is specific to just one type of ion or molecule. 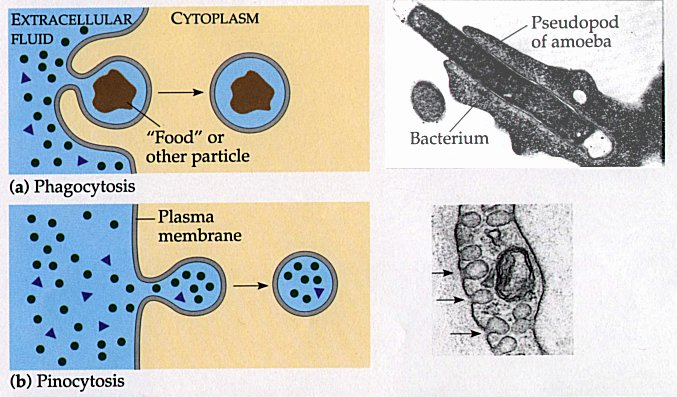 Cells contain many different carrier proteins in their membranes. 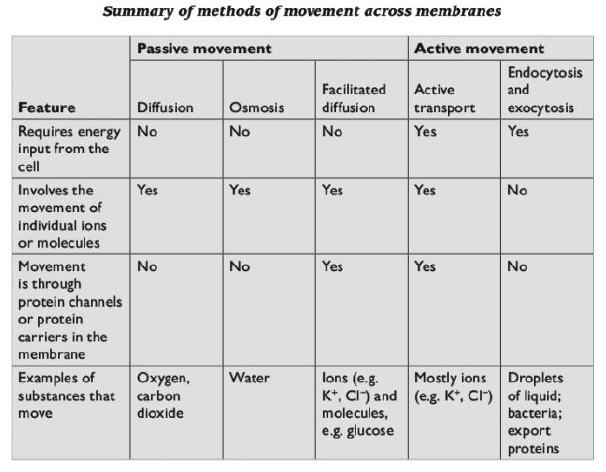 Macromolecules are too large to move with membrane proteins and must be transported across membranes in vesicles. 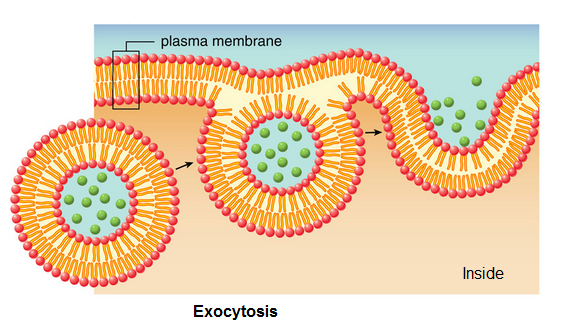 the vesicle is moved to the cell membrane. 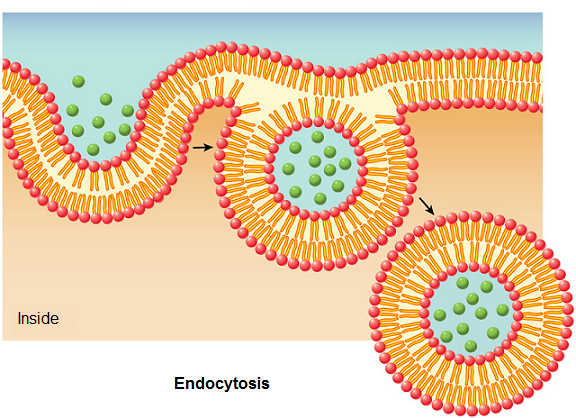 the membrane of the vesicle fuses with the cell membrane, expelling its contents outside the cell. the membrane fuses together around the object, forming a vesicle. there are 2 types of endocytosis: phagocytosis (cell eating) and pinocytosis (cell drinking). The fluid mosaic model allows an understanding of how substances enter and exit cells by a variety of different mechanisms. Investigating the effect of increasing the size of model cells allows an understanding of the constraints of obtaining resources across the cell surface and moving substances out of cells.